You are currently browsing the tag archive for the ‘pig’ tag. To follow up on the Chinese New Year’s Post, here is a drawing I made with ink and colored pencil to celebrate the Year of the Earth Pig. 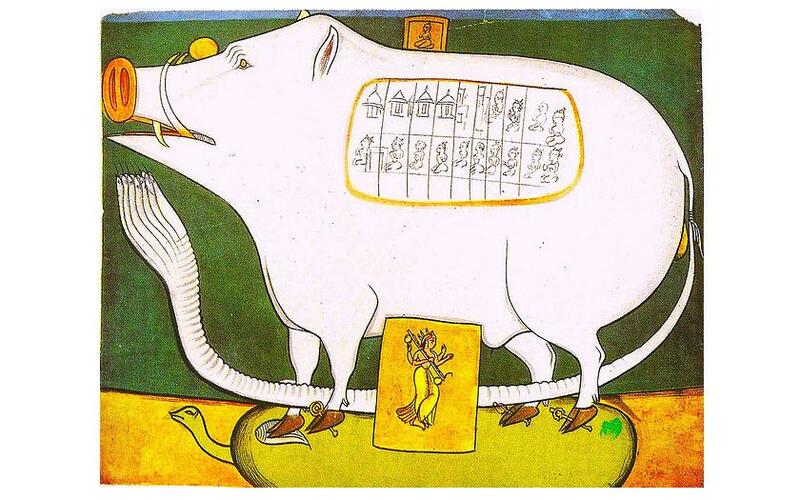 In this context, the meaning of the pig should be self-evident: this is the 2019 Earth Pig, the symbolic avatar of the present moment. We are fortunate that this is a lithe and good-natured piggy: I have seen some fearsome and intimidating hogs which are all shaggy and grim, but this little porker looks almost like a pet. The pig is carrying a giant doughnut with pink icing as a special treat for the Lunar New Year festival. Additionally, the pastry (which I drew “from life” from a Dunkin’ Donut which I then ate) is a reminder of the endless appetite and desire which is a part of life. Existence may be mass-produced and filled with empty calories, but, even so, it is SOOO sweet. Perhaps the torus-shaped pastry also represents the topology of the universe. As ever, the flounder is my symbolic avatar for life on Earth (I promise I will write a post about why, out of all the organisms on Earth, I chose the flounder to represent us). Imbued with special spring festival felicity, this flatfish seems less tragic (and maybe also less ridiculous) than most of the other ones I have drawn. Considering its aquamarine hue, the fish also represent the life-giving element of water. A satellite suggests that humanity’s future (if we have one) lies in space and there, at the bottom right, is our beloved home world! It is such a good-looking planet, but it looks dwarfed by the great allegorical animals which are hovering in proximity to it. Perhaps the pig represents the continents and the flounder represents the seas…. My sassy anti-establishment friend Moira suggested that this artwork was somehow about the constabulary (she lives in fear that America is becoming a police state) but I see no evidence of such meaning in the work (although I do wonder if she is right about the nation). Yet the picture is not all rosy. If this picture is about having an appetite for life, it might also whisper sad and disturbing things about what that entails. Humankind’s principal relationship with pigs, flounder, and doughnuts is all too voracious. Is that also our relationship with our home planet? Only religious fundamentalists and Davos man (aka the planet’s super rich oligarchs) believe that humans are currently acting as responsible stewards of our home world. Both these categories of people seemingly believe that God gave them dominion over the Earth so that they could ruin, despoil, and kill it. Whatever the case, both creatures are watching our world to see what happens next. I have always believed that humans can escape the curse of our insatiable nature only by directing our rapacity away from the finite planet and towards the infinite heavens (coincidentally this is the not-very-subtle meaning of every single one of my artworks for the last 15 years). Can we make any upward progress in the year of the Earth Pig? or are we just going to continue to pig out at a diminishing trough while destiny passes us by? Happy Year of the Earth Pig! Today (February 5th 2019) marks the beginning of Lunar Year 4716 in the Chinese calendar. I really meant to write more dog-theme posts last year during the year of the dog: how did it run off so quickly? But no matter…we can always write more about man’s best friend. Today belongs to the pig and, despite a somewhat grubby nomen, the earth pig has a great deal to recommend it! In the Chinese zodiac, pigs are water sign animals. 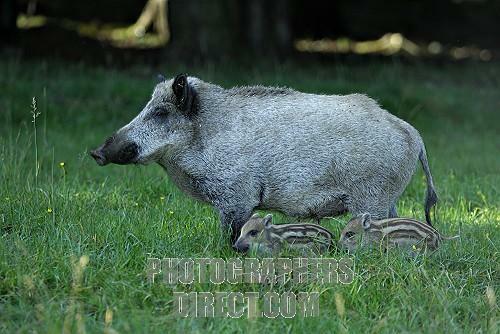 The easygoing and affable earth pig thus betokens a year of friendship, camaraderie, and social success. Pigs love having fun together, so, in addition to social delights, the year will feature plenty of luxuries, treats and opulent spectacles. Friendship and social bonding are one thing, but romance is quite another, so, although the year may be marked by new friendship and bonhomie, it is not likely to be especially happy one in terms of love and intimacy (which is fully in line with broad international trends). 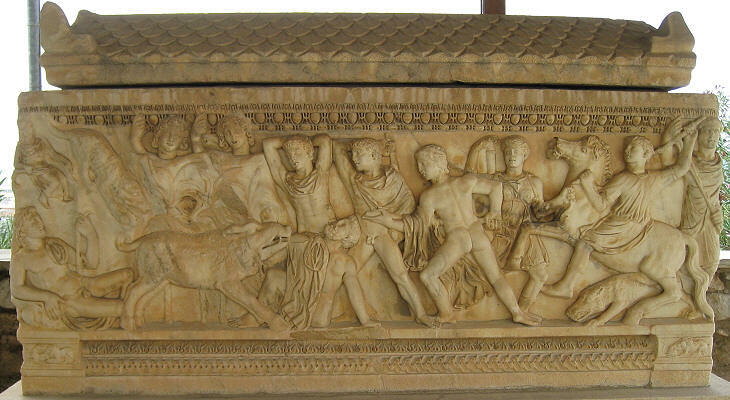 Sadly, all pig years come with an admonition not to overdo it with sweets, rich foods, and alcohol, but I hardly see how gluttony could be a problem here in [checks notes] oh…um…yeah, I guess we will also have to keep a careful eye on what we are eating. 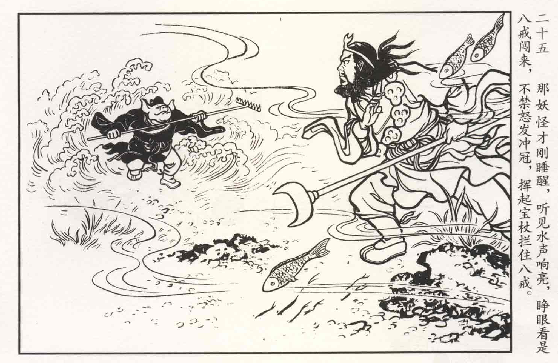 Speaking of gluttony, no conversation about pigs would be complete without a mention of China’s literary superstar pig, Zhu Bajie, one of the three animal heroes of “The Journey to the West” (well, actually there are four, but the horse is usually just a horse and only jumps into the game in moments of true duress). Zhu Bajie is an immortal pig monster with enormous strength and bravery…but he is also cursed with constant hunger, laziness, and a desire for other joys of the flesh. Zhu’s earthy passions cause substantial trouble to both him and his sharper companions (although, ironically, the monkey, who represents intellect, will, and arrogance, usually gets in even more trouble by leaping out ahead of everyone). This is of course o remind everyone that we need the intellect in the upcoming year, but we also need the tolerance, soft-heartedness, and the optimism of the pig. Humans are monkeys after all. Like Sun Wukong, the monkey god, we tend to be rather cruel to pigs. Let the Year of the Earth Pig remind you to be more gentle and compassionate to our big-bellied curly toed friends…or even to yourself if love of luxury or your hungry belly leads you astray. The great lesson of the Chinese zodiac is that we are all animals, but animals have a celestial magic! Be wary but embrace your inner pig and have a wonderful year 4716. Today, October 27th, 2012, the top news story here on the East Coast is the possible trajectory of Hurricane Sandy, a large tropical cyclone which is projected to make landfall somewhere between southern New Jersey and New England next week. However the storm itself is not the point of this post. Instead I am fascinated by the name “Sandy” because–thanks to a coincidence of timing and translation, that name has been much in front of me lately—but not as the name of a human female. Instead “Sandy” is the name an inhuman water monster from Chinese mythology. The monster is a horrifying cannibal, true, but also a strangely put-upon functionary, and then later a devout Buddhist. But I’m getting ahead of myself. Let me explain. Sandy is one of the main characters of The Journey to the West, which is the most fantastical of China’s four great classical novels (four epic works of pre-modern fiction, which scholars regard as the most influential works of literature from that great and ancient nation). 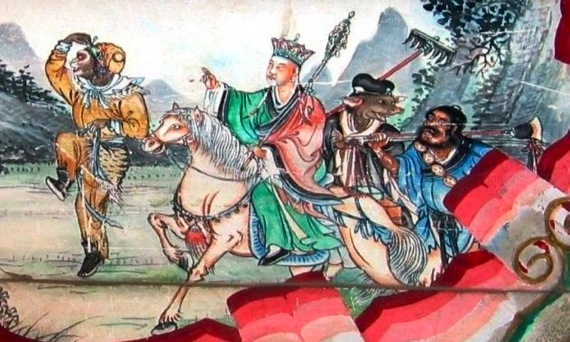 The Journey to the West tells the supernatural deeds of four pilgrims traveling from the court of Emperor Taizong in China to India in order to obtain the Lotus Sutra (actually there are five pilgrims, but one is a young dragon who has shapeshifted into a horse, and he seldom leaves horse-form). The main thrust of the story concerns Golden Cicada (a devout Buddhist priest) trying to control Monkey (a primeval trickster god) and Pig (a monstrous animal spirit whose appetite and bumbling antics provide comic relief). Monkey is nearly omnipotent and exceedingly clever. 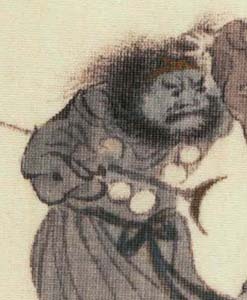 The fourth pilgrim, Sandy (or Shā Wùjìng) is a sort of river ogre who acts as the stolid straight man for the antics of monkey and pig. Together these characters face a host of scheming antagonists while trying to work within the baffling framework of the sprawling bureaucracy of China’s pantheon (this list of the book’s characters will give you a sense of the scope of this plot). The party is aided by Guanyin, the Bodhisattva of compassion who swoops in to extricate them when they really screw up. 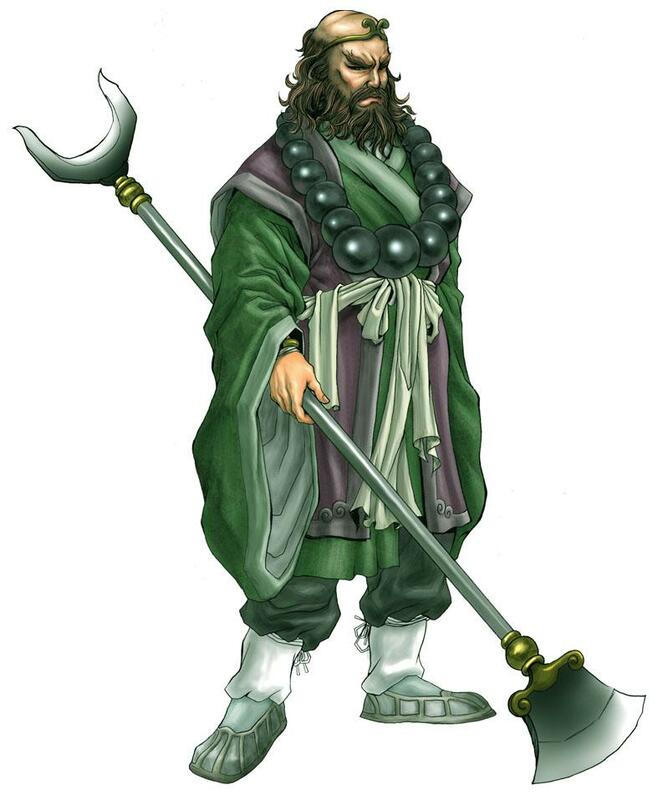 One of the first monsters the monk, the monkey, and the pig encounter is Shā Wùjìng, who has a backstory which illustrate the dangers of the celestial court. Shā Wùjìng was once a general in heaven, where his task was to occasionally lift a special curtain for the Jade Emperor (the ruler of heaven). Unfortunately, in a fit of clumsiness, the hapless general accidentally broke one of the Jade Emperor’s favorite vases and incurred divine disfavor. He was flogged with eight hundred lashes and his form was corrupted into that of a hideous monster with indigo skin, a blood red beard and razor teeth. Then he was exiled to the desert. Understandably, Shā Wùjìng was upset at this fall from grace. 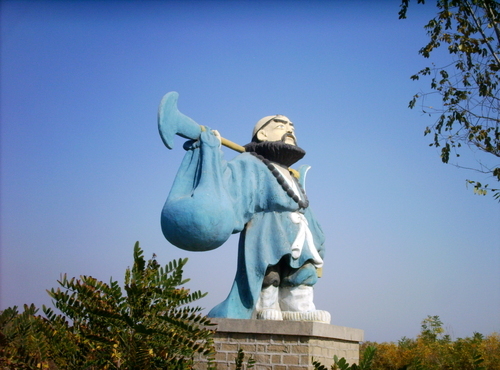 He began to haunt the Kaidu River which flows through the arid wastes of Xinjiang. Every day the Jade Emperor would send seven flying swords to flay open the hapless monster’s chest (the chief god was apparently really fond of that broken vase). To avoid these swords Shā Wùjìng would hide in the sandy river bottom to the extent that he came to identify himself as “Sandy”. Because the desert was empty of resources, Sandy began to prey on the silk caravans heading west to Central Asia and India. In the medieval Chinese worldview, merchants are terrible people of no consequence so there were no repercussions for killing and eating them, but one day Shā Wùjìng unwisely ate a party of holy Buddhist monks who were going to India to visit the sacred lands of Shakyamuni. The skulls of the holy men float on the river, so Sandy fashions them into a necklace which, along with his monk’s spade (a combination of polearm /bludgeon) are his trademark items. In the same manner he ate the earlier party of pilgrims, Sandy attempted to eat Golden Cicada, however monkey and pig easily prevented him from doing so (pig even bestirring himself for an epic battle beneath the river). 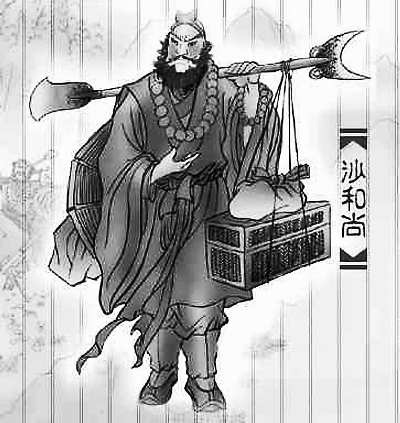 Thereafter Shā Wùjìng himself took up the burden of pilgrimage and he is one of the most loyal and dependable character in the book (although he is less strong than monkey and pig). Of the three monster spirits he is by far the most tractable. 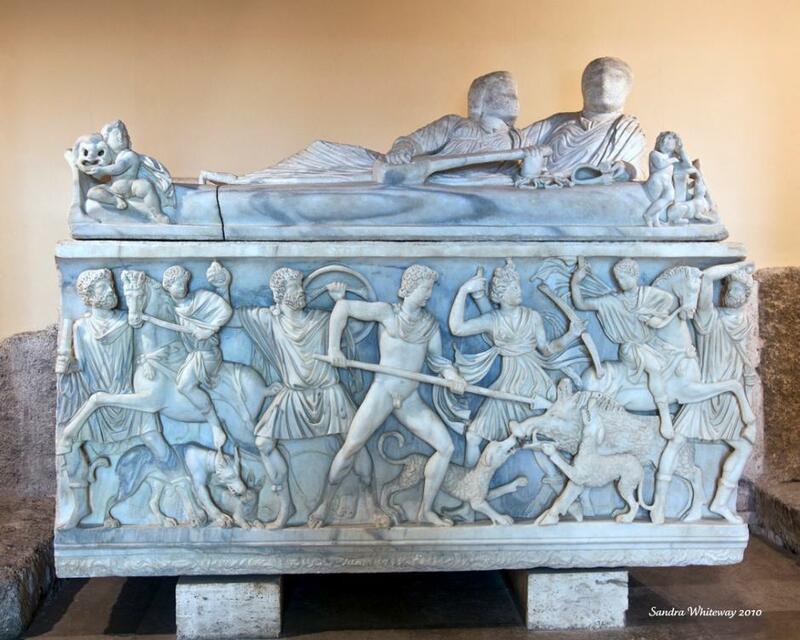 It has been a while since I have done a post concerning all things gothic. 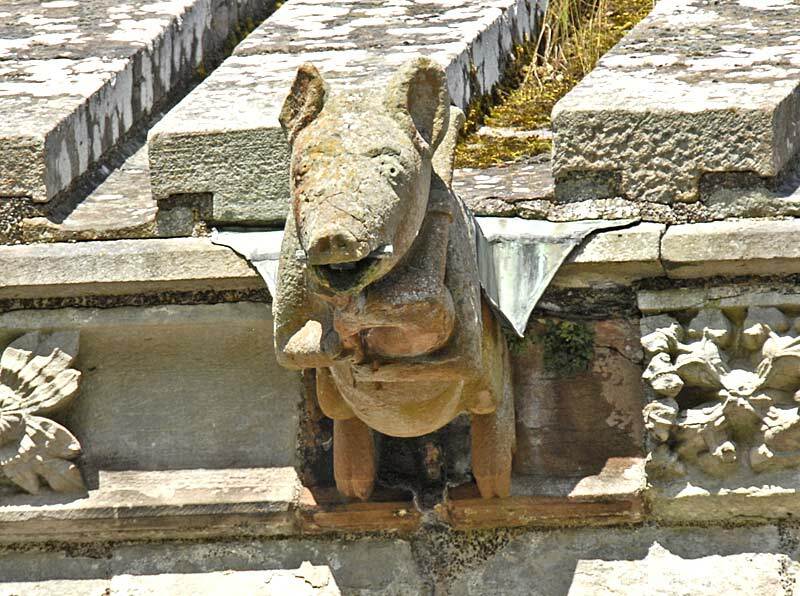 To this end, I was researching images of the magnificent ruined Melrose Abbey in Scotland when I stumbled across the following picture of a gargoyle from Melrose’s ruined walls. It’s a pig playing a bagpipe! And it isn’t alone. 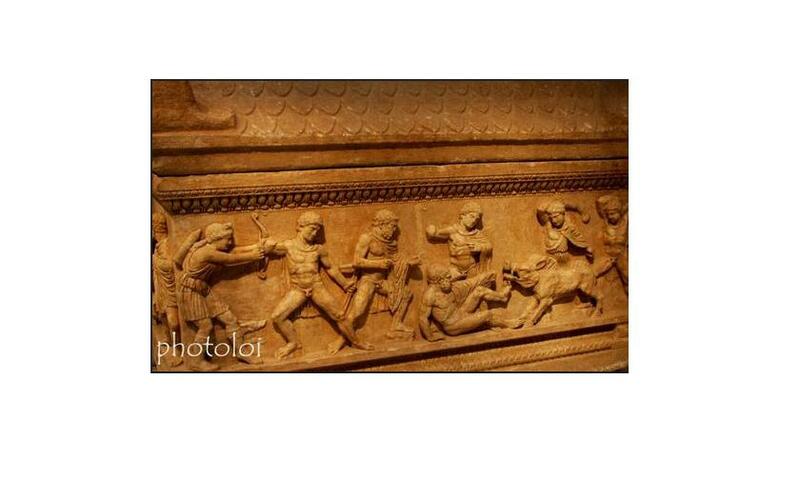 Apparently this was a very popular image in the medieval Celtic world. 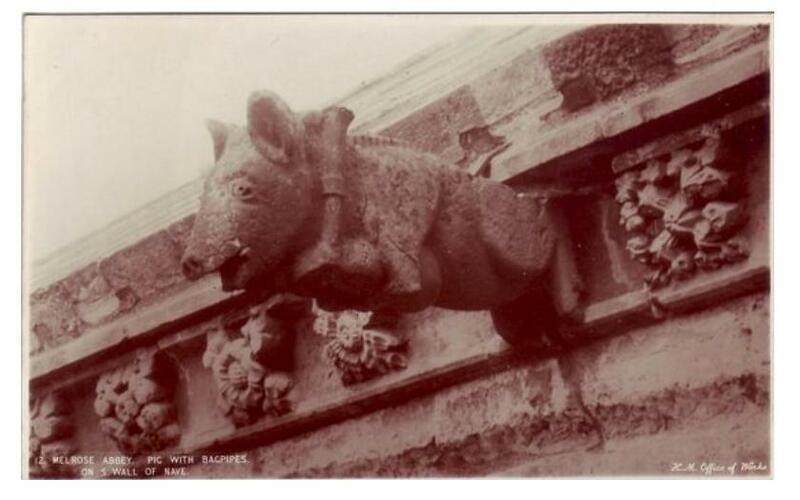 Pigs with bagpipes show up again and again in carvings and illuminations from Ireland, Scotland, and North England–and nobody is sure why. 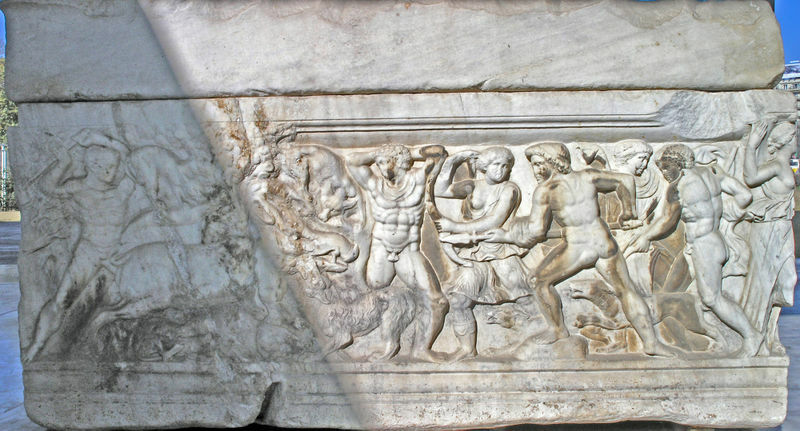 Strong visual imagery is a consistent and important element in medieval art and sculpture, and the bagpipe is found being symbolically played by pigs and angels. 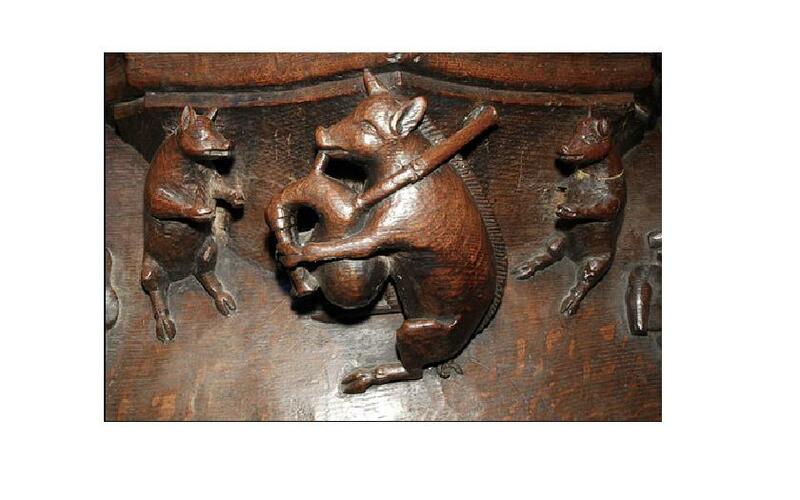 There are intriguingly different ways of explaining the pig pipers of the medieval period. On the one hand, by giving the bagpipe to a pig, it emphatically lowers the status of the instrument but associates it with the animal which could provide an airtight reservoir for the pipe bag. 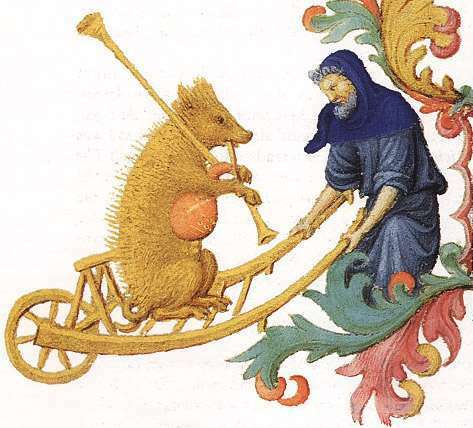 On the other hand it was said that pigs were lovers of music and were often shown in art as musicians, especially in ‘Bestiaries’ which were a popular type of book in the medieval period describing animals in a sort of ‘natural history’ but placing them in an ‘unnatural history’ of allegorical narrative. How delightful! 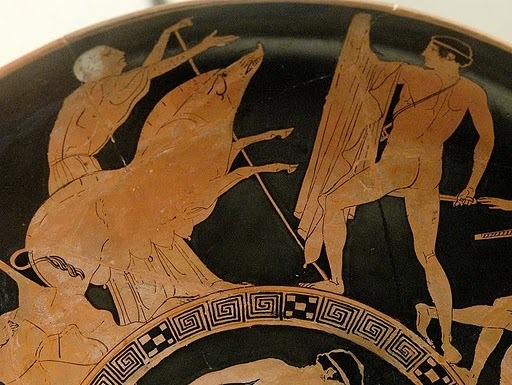 I am a big fan of pigs and I probably ought to write about the bagpipe, that strange shrieking instrument, which is believed to have an ancient history dipped in war and magic. Oh, and I should not neglect my original purpose of showing Melrose Abbey, the epitome of Gothic architecture in Scotland. 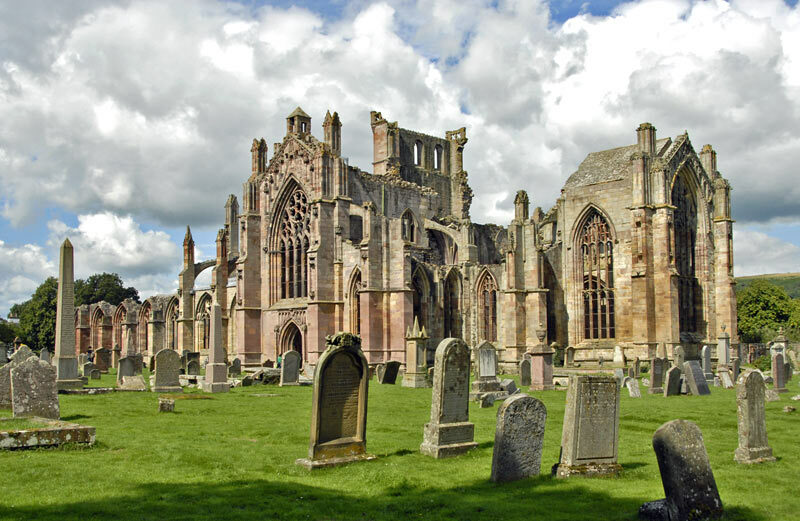 Constructed in 1136 by Cistercian brothers, Melrose Abbey replaced an ancient monastery to Saint Aiden which had been founded in the 7th century. The new Melrose Abbey was burned by Richard II in 1385 but rebuilt. In 1544, English armies again burned the rebuilt Abbey as part of their effort to coerce the Mary, Queen of Scots to marry the child son of Henry VIII. After this the Abbey was not rebuilt, but its beautiful ruins are a major tourist destination in their own right. In the epic stories of Hinduism, Lord Vishnu, the sovereign protector of the universe, was always fighting power hungry demons and monsters (for example one such myth explains the formation of Lake Lonar). Some of Vishnu’s opponents, however, were much more terrible than others. Among the very worst was a filthy albeit incredibly puissant asura named Hiranyaksha (asuras were malevolent and greedy demon-gods). Hiranyaksha was the son of Diti, an earth-goddess who sought–through means of her monstrous children–to overthrow Indra (the king of the gods). Hiranyaksha had golden eyes and a written pledge from Brahma that no god or man or beast could kill him. Through some oversight, the boar alone was missing from the list. Not satisfied with the many atrocities he had committed and the many beautiful things he had stolen, Hiranyaksha grew truly ambitious. He stole the entire earth and carried it to the bottom of a polluted ocean. From time to time, Vishnu took on mortal incarnations–or more properly, “avatars”–to conduct his battles against the forces which sought to destroy or subvert the world. 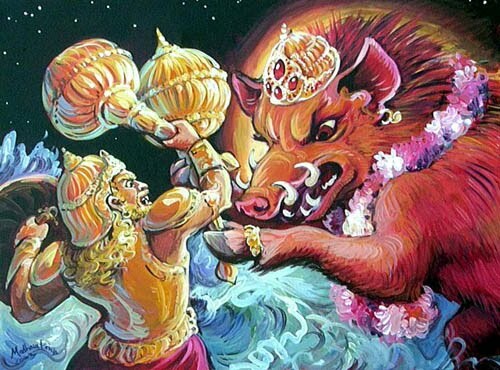 In his third avatar lifetime, Vishnu appeared in the form of a colossal boar, named Varaha in order to fight Hiranyaksha. Varaha sprang out of Brahma’s nostril as a tiny pig, but he grew and grew until he had reached a size sufficient to lift the entire world. 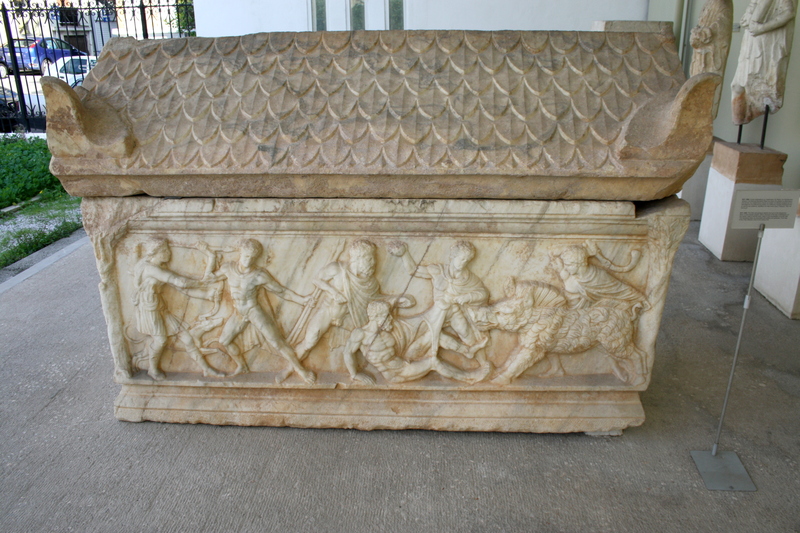 This great boar dived down into the cosmic ocean to find Hiranyaksha and kill him. For an entire millennium, the two opponents battled in the poison depths. Finally Varaha gained an advantage. With his tusks he tore open the demon and with his great mace he smashed Hiranyasha’s head. 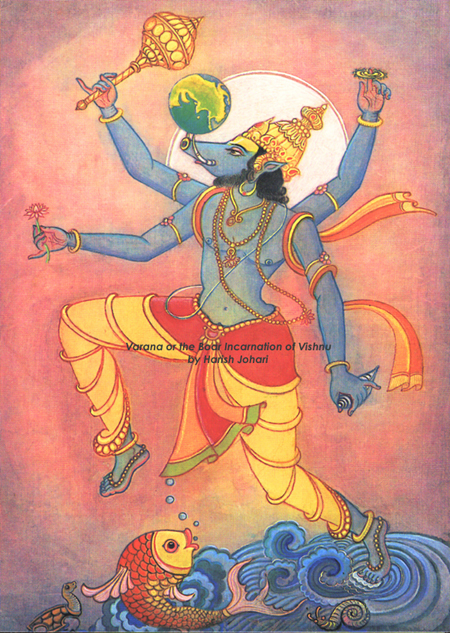 Varaha/Vishnu then lifted the earth back to its correct position with his snout! 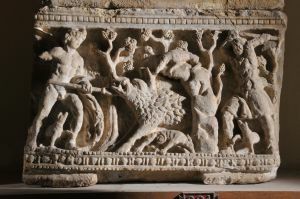 The story nicely follows up on the porcine theme of last month’s post and Hiranyaksha is an interesting addition to the Deities of the Underworld category, but what real relevance can such an abstract story have for us? Surely nobody could be so greedy and insane as to try to steal the entire earth and drown it in poisons. And if such a terrible thing were to happen, what reviled but titanic force could spring from Brahma’s head to assume the role of the big pig and rescue earth from wicked corpora…um demons.